It seems that one of the ways that Hollywood combats being out of ideas is to regurgitate an older movie or television show, rehashing some type of pre-sold property that is familiar enough to draw viewers in by name alone. When they want to make that pre-sold property young and hip, they get Guy Ritchie (who made Sherlock Holmes cool) to direct it. And that’s exactly what they’ve done with The Man from U.N.C.L.E. The Man from U.N.C.L.E. is kind of like an origin story, a prequel to the television show that explains how the team was assembled. 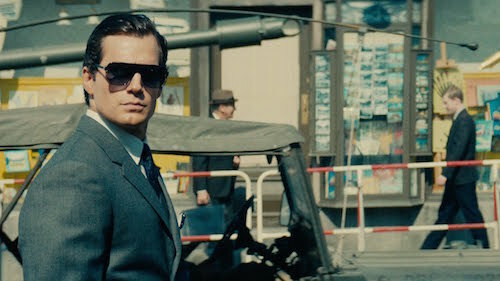 Set in the early sixties during the cold war, the film opens with an American CIA agent named Napoleon Solo (Henry Cavill from Man of Steel) and a Russian KGB man named Illya Kuryakin (The Lone Ranger‘s Armie Hammer) both trying to extract a German girl named Gaby Teller (Alicia Vikander from Ex Machina) from behind the Berlin Wall. Solo and Kuryakin fight over who is going to take the girl, only to discover after the mission is completed that they have been assigned to work together, along with Gaby, at a bigger goal; rescuing Gaby’s father, Dr. Udo Teller (Christian Berkel from Inglourious Basterds), who has been kidnapped by a terrorist organization and is being forced to build a nuclear bomb for them. Despite their differences with (and apparent hatred for) each other, Solo and Kuryakin must work together, along with Gaby, to retrieve Udo before he completes his bomb and the terrorists start World War III. The Man from U.N.C.L.E. was written by Guy Ritchie along with his Sherlock Holmes partner Lionel Wigram, with story help from David C. Wilson (Supernova) and Jeff Kleeman (“Misconceptions”). Obviously, it’s based on characters and situations from the television show of the same name that was created by Sam Rolfe (“Have Gun – Will Travel”), but it is also a completely different animal altogether. It’s not quite as stylized as the director’s other films, but it is clear that Guy Ritchie is at the helm; there’s no The Matrix-style slow-mo camera work during the fight scenes, but when Solo picks a lock, the viewer is taken right inside the mechanism and shown the inner workings of the contraption. From a plot standpoint, the story is a great throwback to classic James Bond-style, economic storytelling, with no extraneous characters or wasted scenes, lots of double- and triple-crosses, and plenty of good old-fashioned action and boldfaced humor. At its most basic, The Man from U.N.C.L.E. is a reluctant buddy picture. Solo and Kuryakin are polar opposites; Solo is coerced into CIA service by a government who recognizes his special talents and threatens him with jail time if he doesn’t use his powers for good, while Kuryakin is a loyal career KGB agent who has spent his entire life working hard at developing the skills that he needs to become an elite fighting machine. Add in the fact that one is American and the other is Russian right around the time of the Cuban Missile Crisis, and it’s easy to see how Solo and Kuryakin would have a volatile relationship. The tension between the characters is one of the elements of the film that is so much fun to watch; one never knows who the real protagonist or antagonist is in a movie like The Man from U.N.C.L.E. The Man from U.N.C.L.E. is exactly the movie that it advertises it will be; it’s Guy Ritchie re-interpreting a spy show from the sixties, and it doesn’t pretend to be anything more. The musical score to The Man from U.N.C.L.E. is awesome. Composer Daniel Pemberton (The Counselor, Cuban Fury) nails the retro spy thing perfectly, coming up with lots of cool jams that are both simplistic and stylish. It’s mostly a typical jazz combo, consisting of bass, drums, guitars, and keyboards, with some bongos and congas laid out on top, and a wailing flute bringing the melodies home. It’s all very Mission Impossible sounding at times (only without the 5/4 time signature), but it still retains its own unique sound. Pemberton’s score for The Man from U.N.C.L.E. is very sixties sounding, and is a great throwback nod to the original television show. It’s not just for opening and closing credits; Pemberton’s music provides the type of soundtrack that can stand on its own, even when taken out of the movie. Like most of Guy Ritchie’s films, The Man from U.N.C.L.E. is a very visceral film. The action scenes may not have as much of Ritchie’s thumbprint on them as his other movies, but they are nonetheless filled with energy and adrenaline. The film is full of car crashes, fist fights, and boat chases, and all of it is done with finesse and flair. Interestingly enough, the fights between Solo and Kuryakin are the most fun, if only because the combatants are so evenly matched and, because they’re the leads of the movie, it’s difficult to tell who’s really got the upper hand. The climactic chase is another highlight; it’s a three-vehicle off-road downhill cat-and-mouse race that is simply exhilarating. An action movie is only as good as its action sequences, and the action sequences in The Man from U.N.C.L.E. deliver the thrills in spades.